If you need to get out of the country…a Passport is a PLUS! But if you’re like me, you will forget that your passport has under 6 months left until the expiry date! So checking your Passport is a PLUS! It wasn’t until I was chatting away to my travel agent recently when she asked to see my passport and give her the details. I was laughing with her about her experiences in New Zealand when my eyes glanced over the expiry date that I suddenly paled and ceased chortling. The passport had 4 months left. Feck. It is very important that you know this…some countries do NOT allow anyone with a passport under 6 months left until the expiry date. So it was understandable I went ‘argh’ like bigfoot and slapped my head on the desk knowing it would take ages to get a renewed passport a.s.a.p. No booking of travelling for me anytime soon! But I jerked my head up and realised, this would be the first time I would have to sort out a passport on my own so it was going to be a completely brand new experience for me, woo woo! 1) Complete the application form online, in which case IPS will print out the completed form and send it to you to sign and return with the supporting documents. 2) Collect it from a Post Office branch that offers the Check & Send service. 3) Request an application form online and IPS will send it to you in the post – allow up to five working days for delivery. 4) Call the Passport Adviceline 0300 222 0000 and ask IPS to send it to you in the post – allow up to five working days for delivery. I decided to go with option 3 as I thought it was more idiot-proof! It did come on time and I ripped open the envelope and read the informative guide that came with it! First things first, WRITE down the bar code of your Passport Application Form… this will come in extremely useful! 1) Send two passport sized photos along with the form. 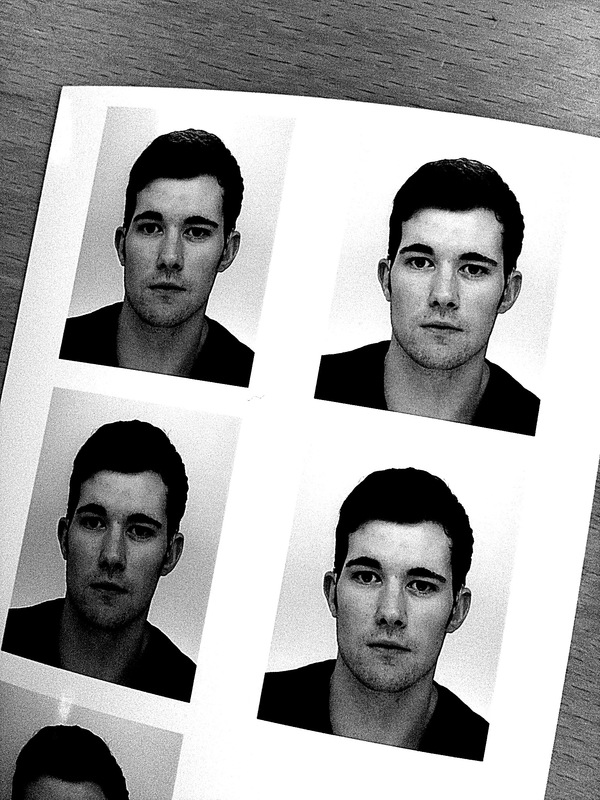 After making me look at the screen incredulously and bringing out the tight-fisted Yorkshireman in me at first as I found out the price of developing 4 passport photos (£5.00?! ), I selected what I wanted and sat back with a smile on my face. Oh, you aren’t allowed to smile. I found out later it’s because in case you are arrested, the police want your passport photo to match to the arrest photo. I mean you aren’t exactly going to be smiling if you’ve been arrested! OR as a friend was flapping at me whilst talking about it on facebook, it’s because smiling would screw up facial recognition software as you spend most of your time in your ‘default’ face. After winding her up, I think she might be right. So I’ve taken to smiling from ear to ear everytime I see a CCTV, the government can’t get me now! Anyway, I’m babbling, back to the photo taking. I got 3 chances to take a picture but I screwed up the first chance which showed me biting my lip from laughing, of course. A high pitched female voice suddenly came on when I pressed ‘GO’ and in a really happy patronising voice ‘ARE YOU READY?! SURE?! LET’S GO!’ and a flash would penetrate my retinas making me blind temporarily! I try to review the first chance out of the side of my eyes until the stars disappeared. Uum, can’t see but I’m sure it was naff so let’s take another one. This time I was prepared for the CBeebies ex presenter voice! FLASH! More Stars! And another one! FLASH! Now I’ve had quite enough… I’ve paid 5 pounds to get talked down to and become temporarily blind. Now my friends will not at all be surprised that I spent 15 mins choosing which pic to choose until the curtain whipped open and an irate granny demanded I hurry. Oooh, option 2 or 3? They both look the same yet different…I decided to press option 2 as option 3 looked like one of my pupils were blown so off outside I went to hear the clickety clack of the photos being made and POP! The photos arrived and was destined to become the signature picture of RexyEdventures! 2) You need a counter signatory for your application proving that you do exist and also to sign one of the passport photos that this is a true likeness of you. I’ll never forgive who I asked for the honour. She laughed and shrieked at my passport photos for a good 10 mins. But she did fill the requirements – knew me for at least two years, a professional, and worked in a public position (for she was a pantomine granny villain!) and she duly signed the photo. REMEMBER, when you ask your counter signatory for the honour, remind them to bring their passport (albeit not less than 6 months before the expiry date) as you will need their passport number. 3) Your old Passport to be included with the application. I was kinda sad at this. It had my past travel visas and stamps in this, particularly Uganda. But I was overjoyed to find that it will be returned to me but with the corner of the passport cut off making the passport invalid. So when I show it to my dis-interested grandchildren in the far flung future, I’ll be wrapped up with the memories of yore! If you were born on or before 2 September 1929, your passport is free of charge. However, you will need to pay the extra fee for Fast Track or Premium services if you use them. Damn, I wasn’t born before 1930! This, again, irked the tight-fisted Yorkshireman in me and I balked at the cost of forking out £77.50. But I had the satisfaction of knowing that this time of year would be the best to get a new passport (Sept-Nov) as for some reason the passport and identification service goes slightly quiet, therefore a quicker return for a brank new spanking Passport, which will be a PLUS! So will everything sorted, I hightailed it to the post office and pushed the envelope over on the counter, looking behind me and said in a conspirational voice ‘this is my passport renewal’. The post mistress nodded and closed her eyes in response and then duly said to me ‘That’ll be £5.00 please’ WHAT?! Didn’t she know she was dealing with a Yorkshireman?! Where’s my nearest cafe that will sell Yorkshire tea to calm down my nerves?! Ah so, it’s for special delivery to ensure the Passport application arrives safe and on time. Hmmm…okay. Now did you remember that I told you to record your passport application barcode? You can quote this if by the off chance you would like to know the progress of it. So always keep it handy! Now, I’m still waiting for my new passport and I cannot leave the country at the moment. I’m too scared of crossing into Scotland after all this talk about independence, just think. I’ll be forced to become Scottish should anything happen? !